But I didn't expect to expand my culinary world just a bit. 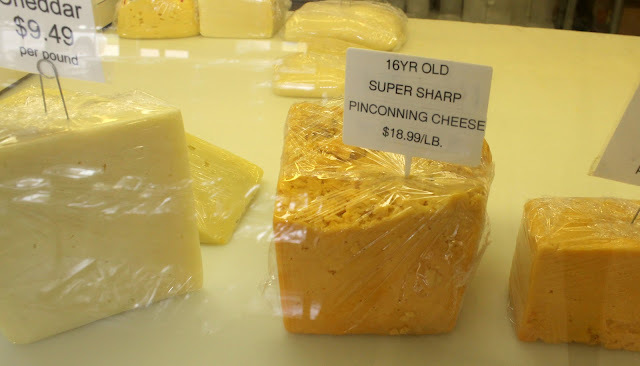 But with the introduction of Pinconning cheese to my palate, I did just that. My interest was piqued as we drove through town on our way to my inlaws' cottage. A few cheese shops dotted the main drag. It was actually Big Arrow who drew my attention to them... one has a gigantic mouse eating a wedge of cheese on the roof and he was naturally delighted by that. Sure enough, when my inlaws put out a table full of food that first day, one of our snacking options was a tub of Pinconning cheese horseradish spread. (The Williams brand. It matters.) One scoop on a pretzel and I was hooked. We all were, actually (brother-in-law, I'm looking at you, buddy). So on a rainy morning with little else to do to pass the time, we ventured out to the Pinconning Cheese Store to explore this a bit more. Big Arrow was sold right at the entrance, having been welcomed by a very familiar face. We were greeted by kind ladies who offered us samples. 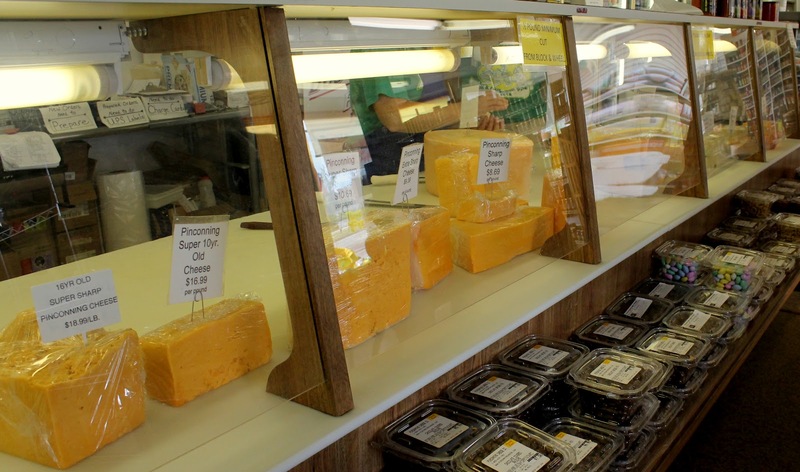 One glance through the glass display case and it will be clear that they're particularly known for the sharpest cheddar you'll ever find, anywhere. I sampled their sharpest variety. Aged 16 years. So sharp it makes your mouth pucker. Naturally, on their most recent trip up, my inlaws' brought some of that amazing horseradish spread back for us (we may or may not have put in a request for it). I now spend afternoon naptime trying to avoid it in the fridge, and ultimately failing and eating way too much of it at 3 p.m. each day. Last week, the letter "a" got stuck on my laptop from pretzel crumbs. Oops. 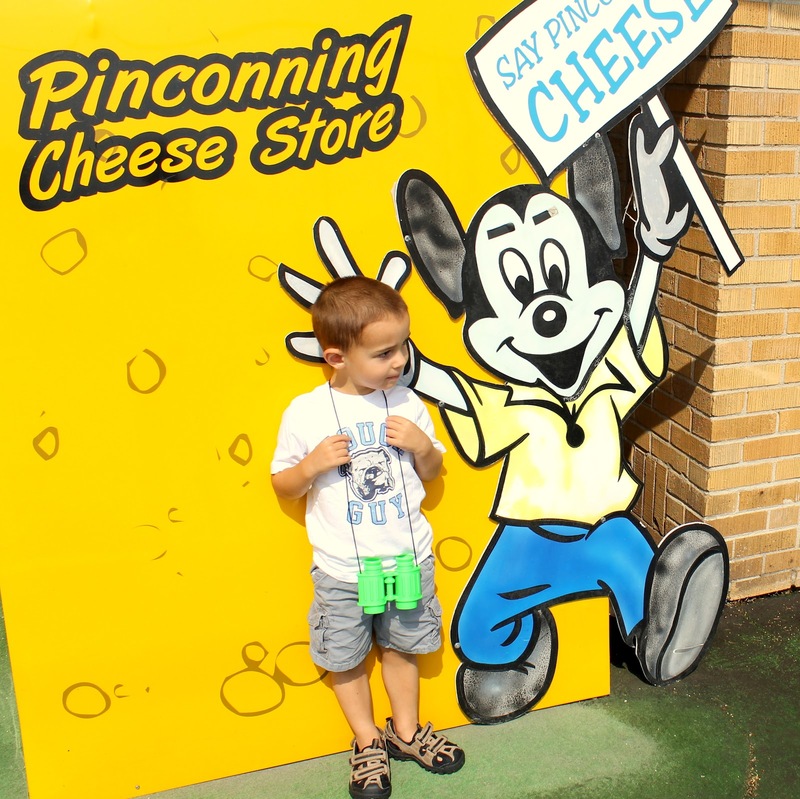 Insider Tip: There are actually 3 different cheese companies in Pinconning: Pinconning Cheese Company, Wilson's and Williams. (Healthy competition, I guess.) Take your pick, but I liked the Pinconning Cheese Store for sampling the cheese, especially the sharp cheddars. I hear they're the ones who age it the longest. 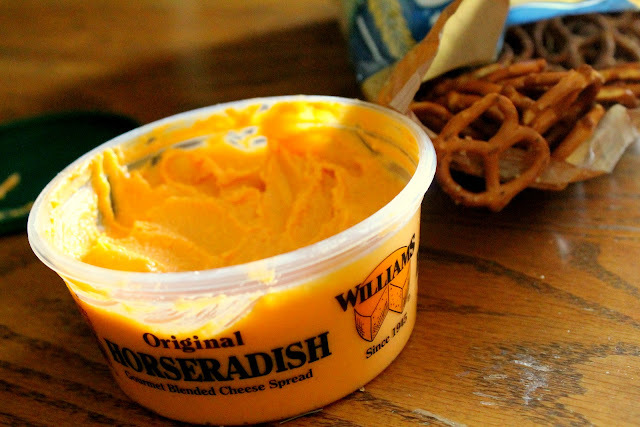 But like I said, don't miss Williams' horseradish spread.